Aimed at: Business people who want to make their own videos to market their businesses online. Ideal for videoblogging and customer testimonials. Pre-requisites: None – just bring your smartphone. 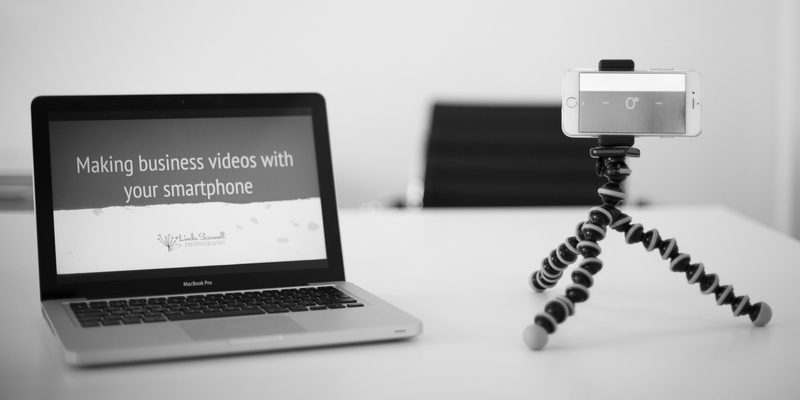 If you’ve got an iPhone 4S or above, it’s definitely good enough for video. For Android phone owners, check the technical specification of your phone (most are online so Google your phone model and “tech spec” to find it). If it says your camera is capable of producing 1080p video, then it should be good enough. We’re regularly told that using video to promote our goods and services helps with attracting new clients to our businesses. But if you’re a small business, just starting out or you want to video blog (vlog) regularly, employing a professional filmmaker to create your content ican be impractical. Even if budget isn’t a problem, you may want to create videos on an ad hoc basis without needing the services of a professional videographer. The good news is if you own a smartphone, chances are you’ve got a good quality video camera in your pocket or bag. Not feeling confident enough to appear on camera? Sign up for Linda’s free online course: 5 Steps to Being Confident on Camera. I think Linda is brilliant at teaching this stuff. Very approachable, easy to follow, friendly, confident and confidence inspiring, and great fun. What an info-packed course. Just brilliant. Essential for anyone growing their business. Highly recommended!